Beachbody's Best Selling Supplements - Our top-selling supplements help you slim and tone while giving you the energy you need to maximize your results. Daily Sunshine is the whole-food-based 3-in-1 smoothie formulated for kids’ nutritional needs. With a fruit and veggie blend, plus plant-based protein and healthy fats, it's a delicious, balanced snack with a pediatrician-approved formula and kid-approved taste that's guaranteed to please even the pickiest eaters. 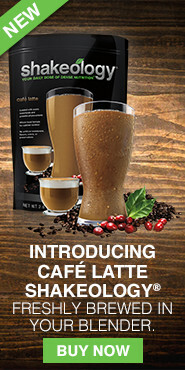 An ultra-premium nutritional health shake that provides the widest array of superfoods, vitamins, and minerals from around the world in a nutrient-dense but low-calorie formula. One that can’t be replicated anywhere. With Beachbody Performance, you get pre-workout energy, during-workout super hydration, post-workout muscle recovery, and overnight muscle repair to maximize your results! 2B Mindset is a breakthrough in weight loss. It’s a video-based program that focuses on what you can eat instead of what you can’t—so you can lose weight happily without feeling hungry or deprived. Reclaim. Release. Restore. In just 3 weeks, you can help your body cleanse from the inside out—while helping improve the way you feel and function. Enjoy the foods you love and still lose weight with these color-coded, premeasured containers and the Fixate cookbook, Autumn Calabrese's very own collection of portion-controlled recipes. Cook delicious dishes and eat exactly the right amount each and every time. Enjoy the foods you love and still lose weight with the Fixate cookbook, Autumn Calabrese's very own collection of 101 delicious, portion-controlled recipes designed to work with the 21 Day Fix® containers. 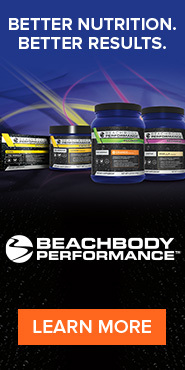 The Beachbody Performance Sampler Kit is the perfect way to try all 5 performance formulas before you buy the full-sized tubs. You'll get one single-serve packet of each Beachbody Performance product: Energize, Hydrate, Recover, Recharge, and Creatine. Experience the benefits, taste the delicious flavors, and see for yourself how much better your workouts can be! The Ultimate Performance Stack contains 5 supplements to help increase energy and endurance, support hydration, increase high-intensity exercise performance, combat training-induced muscle soreness, and speed muscle recovery to help give your body what it needs to get in the zone and stay in the zone. Your next challenge awaits. * Available with Chocolate or Orange Recover. Help combat exercise-induced muscle soreness and jump-start recovery so you can hit each training session just as hard. Recover takes advantage of the critical post-training window with the ideal combination of time-released proteins and phytonutrients to help facilitate muscle recovery and reduce muscle breakdown. Take Recover after every training session to help combat exercise-induced muscle soreness, speed muscle recovery, and restore your strength. Forget about counting calories! These 7 color-coded containers help you portion out exactly the right amount of food, so you never eat too much or too little. It's the simplest way to achieve your best results. Maximize your results with our effective supplements! WARNING: Please consult your physician before beginning any supplement or meal replacement product, particularly if you have any unique or special needs or conditions, such as food allergies, dietary restrictions, or if you are pregnant or breast feeding. The content on this site is for informational purposes only and not intended to provide any medical advice, diagnosis, or treatment.